Dental implants are a great solution to replace your missing teeth with the next best thing to your own. As you start your journey to a complete smile, it’s important to understand the terminology you will hear. With this quick guide, you’ll know exactly what your dentist is talking about through all aspects of your treatment. An abutment acts as a connector piece to attach your restoration to your implant post. Your gum tissue heals around it to seal out bacteria while creating a natural-looking smile. Ceramic is used to make your prosthetic teeth because it closely mimics the appearance of enamel. Your restorations are designed to meet your exact size, shape, and color needs. Generally, a crown is a protective cap that’s placed over a tooth to restore its health, function, and appearance. When used for dental implants, it refers to the restoration that’s attached to the implant post to replace a single tooth. 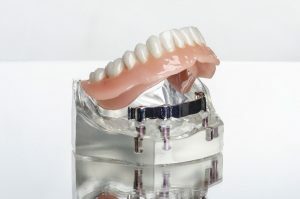 A denture replaces an entire arch of missing teeth. The traditional option uses suction or an adhesive to hold in place; however, dental implants can also anchor it to your jawbone. This is the most common type of implant. It looks like a small screw that’s surgically placed into your jawbone to serve as a new tooth root. This implant rests directly on your jawbone. It’s not widely used because it’s considered outdated, but if you have a risk of bone resorption, your implant dentist may recommend it. Also referred to as a “fixture,” the implant is the foundation for the replacement tooth. It’s surgically placed into your jawbone and has the potential to remain in place forever. An implant-retained denture doesn’t rely on suction or an adhesive to hold it in place. As an alternative, an average of 4 implant posts secures it to your jaw. 1 or more missing teeth can be replaced with an implant-supported bridge. Unlike a traditional bridge, crowns aren’t placed on your adjacent teeth. Instead, 1 to 2 implant posts are used. This refers to the process that occurs after your implant post is placed. Acting as a new root, it stimulates your jawbone to encourage growth. Over time, your jawbone will fuse to the post while restoring its density. If you have minimal bone height in your jaw, a subperiosteal implant can be used. It rests on top of the jaw. A metal framework protrudes through the gum tissue to support the replacement tooth. Most dental implants are made from titanium because it’s biocompatible and hypoallergenic. Completing your smile with dental implants doesn’t need to be confusing. With a firm understanding of the terms that are used, you can head into your procedure with confidence. At the age of 12, Dr. Megan Shelton knew she wanted to be a dentist. Following her passion in life, she provides her patients with individualized solutions to help them maintain optimal oral health and functions. She combines her qualifications with the latest advancements in dentistry to improve their quality of life. If you’re interested in dental implants, she can help. Contact our office today to schedule your consultation.